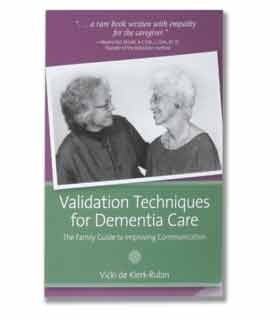 Validation Techniques for Dementia Care Vicki de Klerk-Rubin The Validation system is a method of communicating with people with dementia that offers relief from stress and keeps them connected. This is a practical handbook with all the information and guidance needed to successfully implement the system. Specific verbal and nonverbal communication techniques are explained in detail and illustrated in photographs. Ten case studies demonstrate how to use this approach. 132 pages, softcover.